Happy Friday love bugs! Is anyone else SO thankful that it’s Friday? It may have only been a 4 day work week – but my booty was kicked! ha. 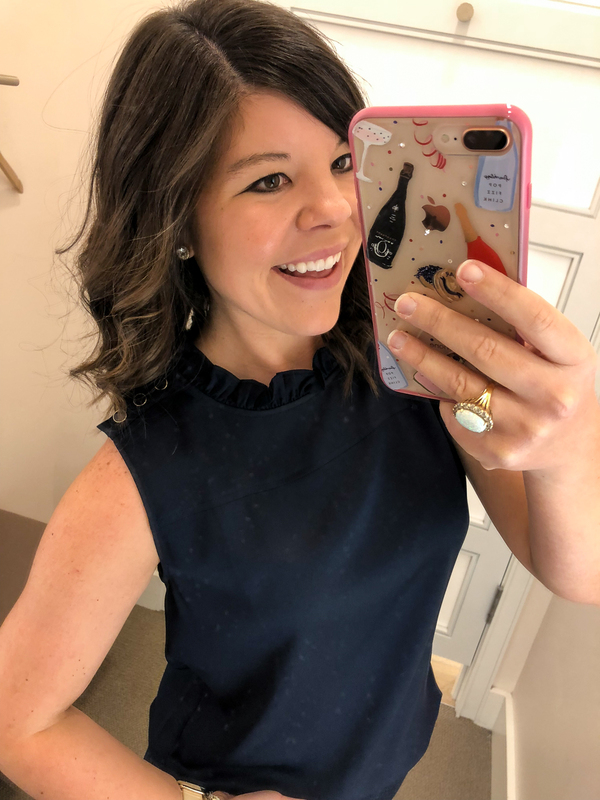 I certainly can use some fun & cheer to end the week, so I’m thrilled to bring you a fresh round of Dressing Room Diaries today! Before we get started… I guess you should get the stats; I’m 5’4 & typically a small on top or a 6/Medium on the bottom. Hopefully that helps y’all with sizing as you see how things fit on me 🙂 Let’s get the fun started! 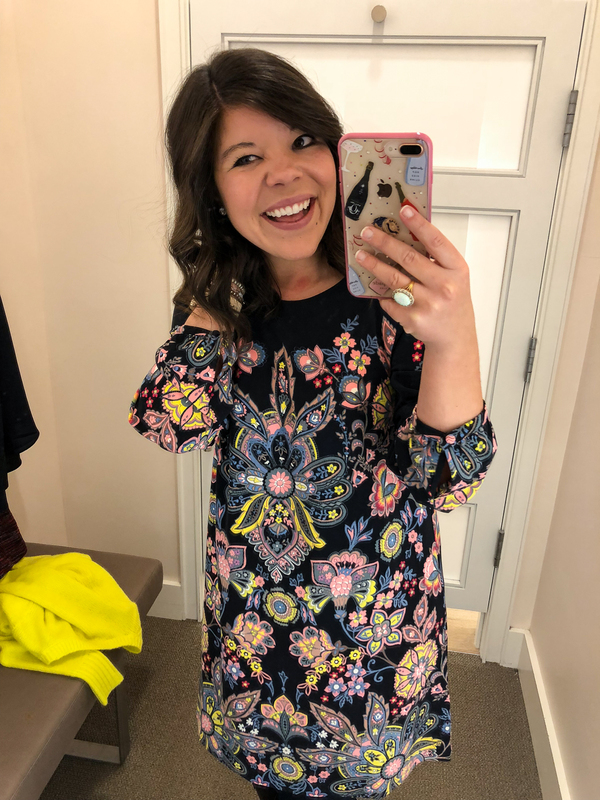 Floral Shift Dress (small)- I loved the vibrant colors in this dress! I would have never looked twice had I just seen it online, but this dress was so pretty in person. Runs TTS. 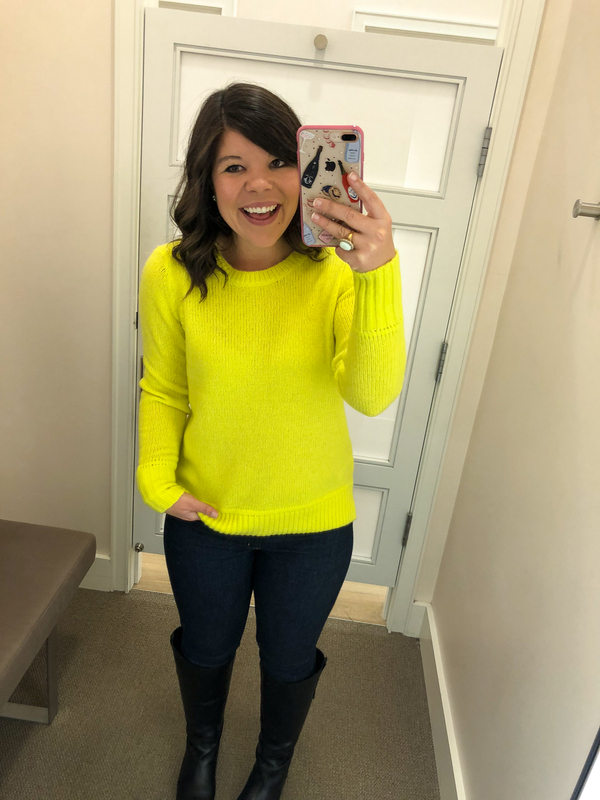 Yellow Sweater (small)- Y’all know I got so excited about this one- hello brights! While the small fit fine, I think I actually would like it better sized up for a little more length & a roomier fit. 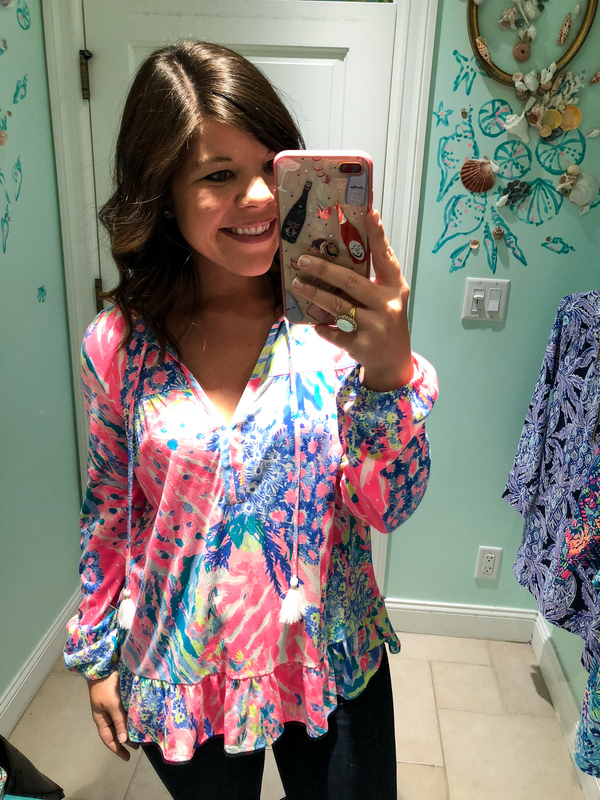 Floral Tunic (small)- The print on this top is SO pretty! I’ve seen this top all over IG and it looks great on everyone! 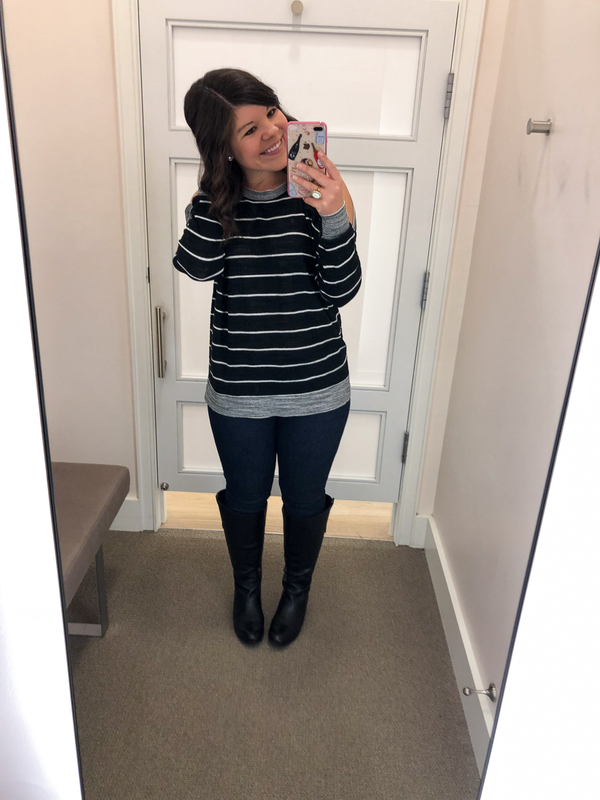 Striped Cold-Shoulder Sweater (small)- I really wanted to love this sweater, but the fit was a little “off” for me. But I still thinks it’s adorable & worth trying if you really like it! Knit Tunic Top (small)- Give me all the comfy tops for spring! How darling would this top be with white cutoffs in a few months? 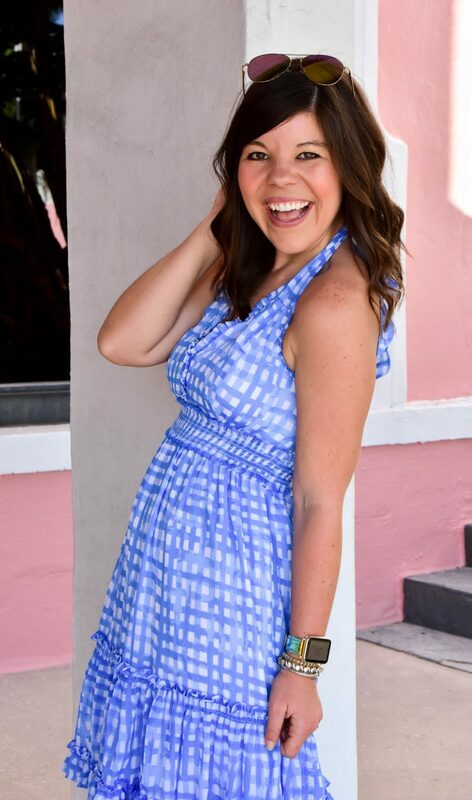 Swing Dress (small)- ruffle sleeves (check)! adorable print (check)! swingy shape (check!) I have this dress in two other prints & love it season after season. Popover Dress (small)- I wish the lighting was better so you could see the pretty purple color of this dress! 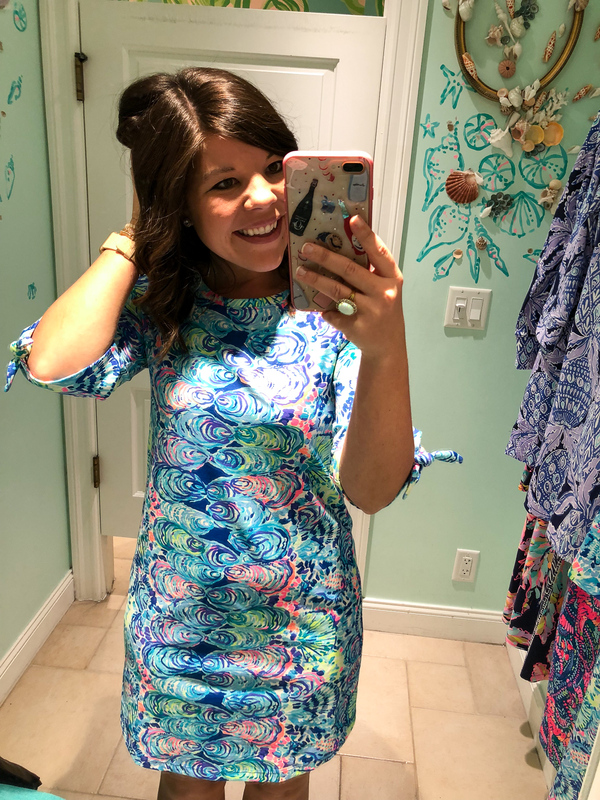 It’s just about the comfiest ever & I can see why it’s the #1 dress on every Lilly lover’s wishlist! 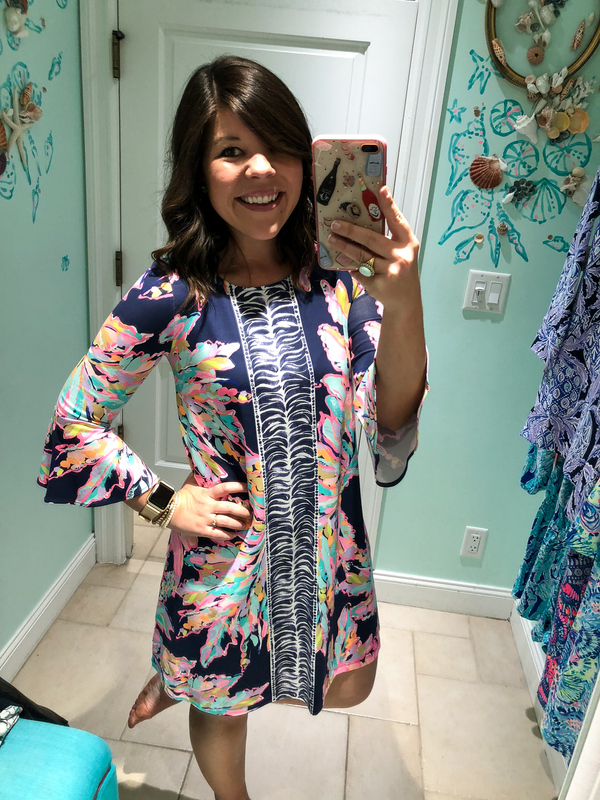 Tie-Sleeve Dress (small)- Can I just tell you how precious the print is on this dress? It’s so much fun and has me craving the beach & summertime like it’s no-body’s business! 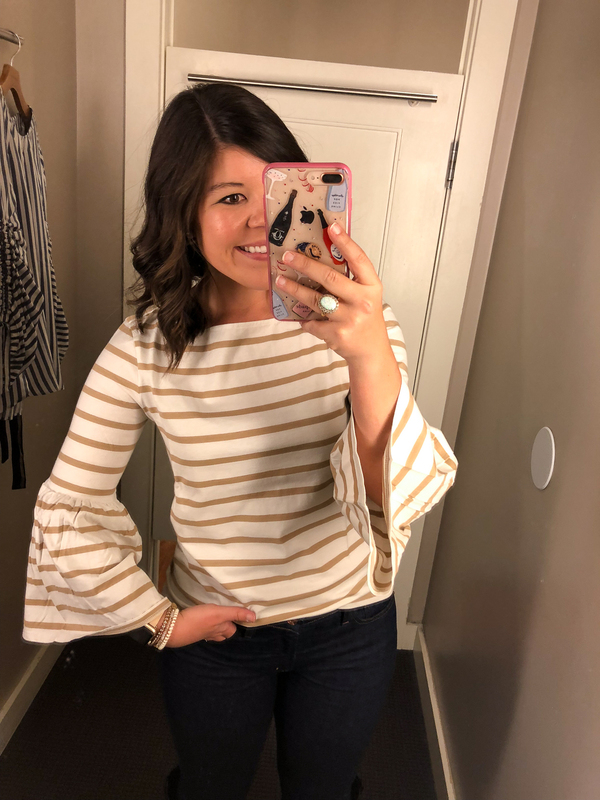 Striped Bell Sleeve Top (small)- I didn’t expect to love this top nearly as much as I ended up loving it! 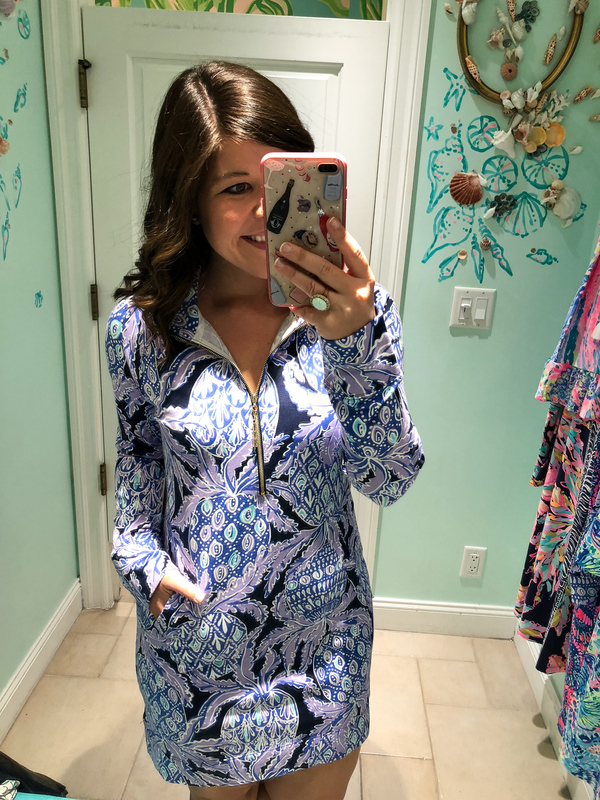 It fits like a glove, the print is so classic, and it’s going to be perfect for Spring! Striped Tie Sleeve Blouse (small)- hello pretty! 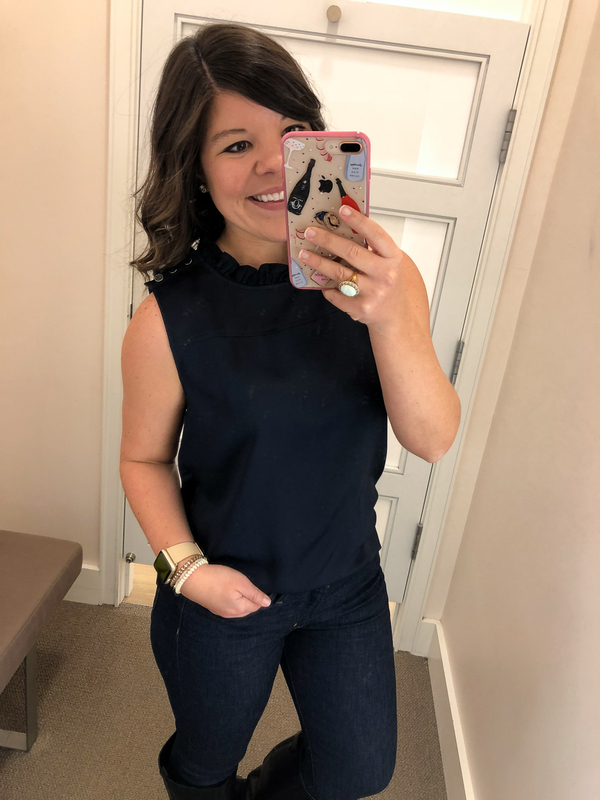 This is a totally luxe top that would be so good for work or a night out- it’s simply gorgeous in person! 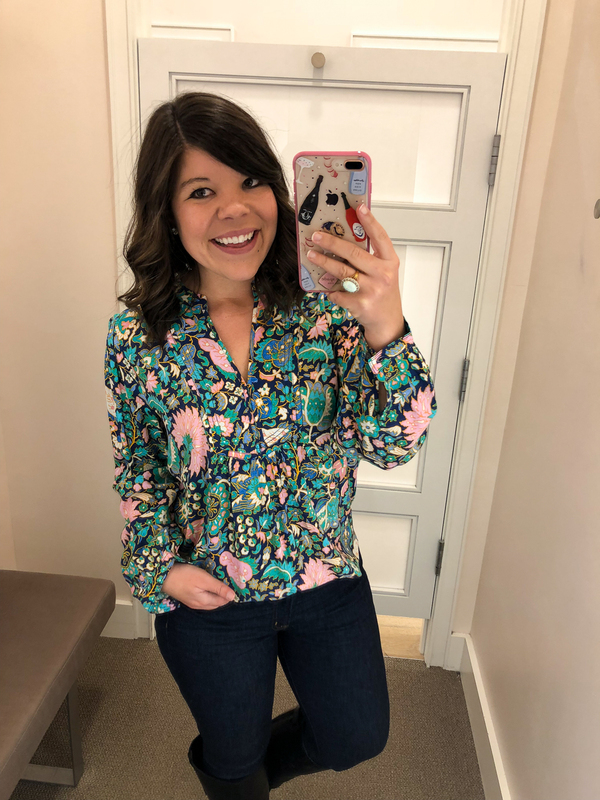 I hope y’all enjoyed today’s edition of Dressing Room Diaries and found some fun pieces! Throughout today I’ll also be updating the best weekend sales- make sure to check back so you don’t miss out! Uh, you look great in everything!! I love the last two tops especially. Thanks girl! 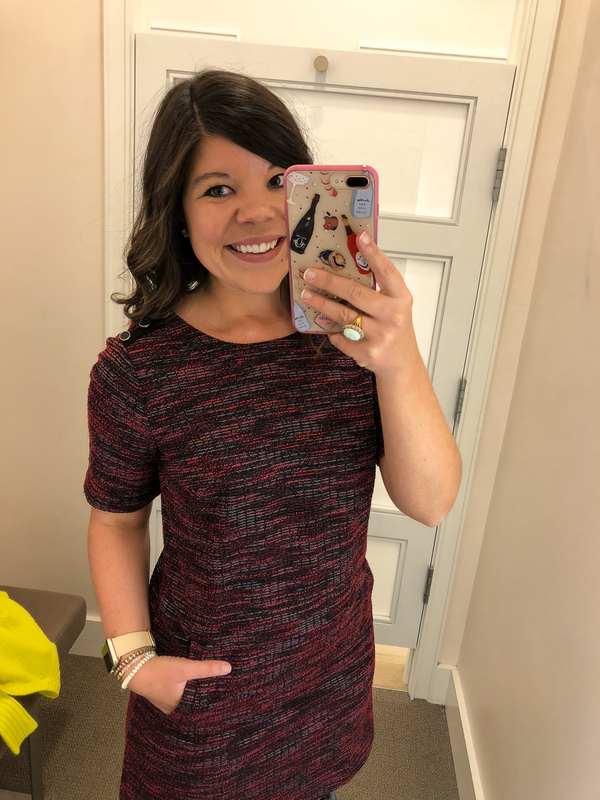 It’s so fun starting to shop for a new season! You have the cutest smile! I love your outfits and it makes me excited to spring! Oh so many beautiful tops! I have been needing some new tops for this season! Great dresses too. That yellow sweater is sooo cute! Love its vibrant color, really pops out! And of course, you can’t go wrong with florals! So many cute items! Love that yellow sweater! Perfect pop of color for winter! It totally is! I love it! 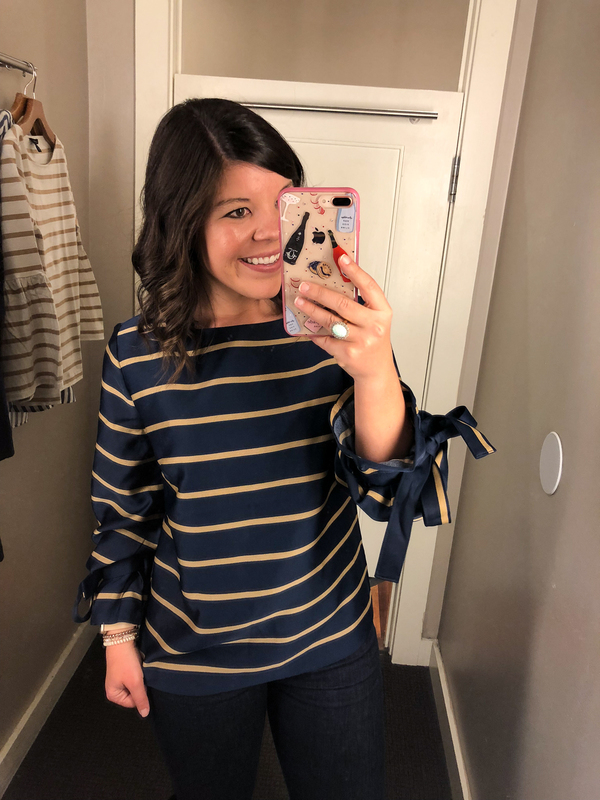 I’m a sucker for anything with ruffles and that navy top is amazing! I love a good ruffle too! Thank you for stopping by! I know it’s a month old now, but I included this post in a blog post of mine. Hope it’s okay!